PCI is a leading private insurer of affluent individuals and families as well as many professional athletes, celebrities, executives and wealthy clients in other select high-profile professions. We are here to insure your health and your wealth and we take our job as seriously as you take protecting your wealth, your assets and your family. As well as insuring your health, your wealth, your home(s), your automobile(s) and all of your valuables, PCI is also a leading private insurer of yachts, mega-yachts and all types of luxury boats and pleasure craft. Our brokers are here to help make sure your dream yacht is fully and adequately covered against damage or loss and has full liability coverage. Whether you own a motor yacht, a power boat, a cruiser or a mega-yacht, you need insurance suited to meet your specific needs and the way you enjoy your vessel. PCI and our carriers are all dedicated to providing you with the best insurance coverage available for your specific yacht, giving you the peace of mind you need to feel secure and relaxed whenever you're on the water. One of our primary carriers, ACE Group, has been a leading provider of yacht insurance for decades and can offer some of the most comprehensive policies available for both private pleasure and select charter usage with their Yachtsman® Policy. The Yachtsman® Policy can provide yacht owners peace of mind with all-risk protection for a wide range of pleasure yachts. The Yachtsman® Policy provides complete coverage for yachts up to 27' in length and up to $5 million in value, including select occasional charter vessels. The Yachtsman® Policy also offers many other unique benefits and features that are unmatched in the industry. The Yachtsman® Policy covers personal yachts, corporate yachts or occasional charter vessels with values up to $5 million. A wide range of cost-saving, enhanced or tailored coverages can be offered to fulfill specific needs and navigation limits can be designed to meet each owner's own cruising needs. Both of our other carriers, AIG and Chubb, also offer very attractive and customizable watercraft, yacht and mega-yacht coverages for your vessel, which can also be designed around your specific needs and cruising areas. No matter what type of vessel you have, we have seasoned marine professionals at the top insurers in the insurance industry, ready to take care of your ship and make sure it is fully protected and covered. Property Coverage - Our comprehensive coverage not only protects your yacht in the event of a loss, but also covers items such as tenders, fine art, personal property and furnishings at separate, lower deductibles. Agreed Value - For boats insured for $1 million or more or that are over three years of age, Chubb offers "agreed value", which essentially settles a covered loss before it occurs. If you are a mega-yacht owner, you know you have specific needs that are not covered by standard marine policies. Your vessel is an extremely large investment and we have the expertise to provide you with the best mega-yacht insurance coverage available in order to protect that investment. We offer specialized coverage for vessels over 27' and we will be glad to discuss our Mega-Yacht Insurance options if your vessel has a value greater than $5 million. 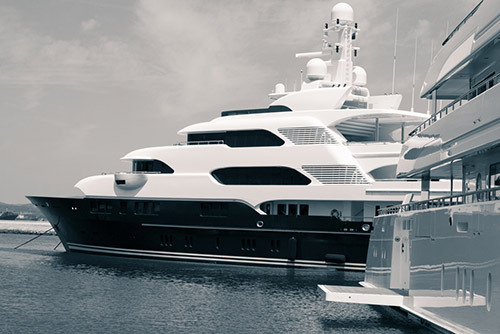 If you are a yacht or mega-yacht owner, or you represent a yacht or mega-yacht owner and you would like to find out more about how PCI can provide insurance coverage for your vessel, or schedule an appointment, call us at 301-245-0130. We look forward to hearing from you.